More than 170 people accompanied SERC Chile researchers to celebrate the launch of their new phase, which took place in the Honor Hall of the former National Congress, in Santiago, on the afternoon of Thursday, April 19. Government authorities, the universities and institutions that make up SERC Chile, representatives of companies that are strategic partners in some projects and of the most important institutions of the energy sector, met to celebrate the success of the first period of Fondap-Conicyt center of excellence (2013-1017) and to welcome this new phase (2018-2022), in which SERC Chile is committed to continue working to grow the solar scientific community to which it belongs. Due to a previously planned trip out of Santiago, the Minister of Energy, Susana Jiménez sent a video greeting to SERC Chile. “I encourage you to move forward, helping to create advanced human capital, cooperating in science and effectively articulating with the private world. The Ministry of Energy will have the doors open so that, jointly, we can advance in the energy modernization of our country,” he said. The ceremony started with an presentation by the Director of SERC Chile, Rodrigo Palma, who made a historical revision of the development of solar energy in Chile, described the evolution of our center and reiterated a key concept in this new phase: to contribute, from science, to the sustainable development of the country through the use of solar energy given a solar wealth of such magnitude that Chile could potentially export energy to all of Latin America. 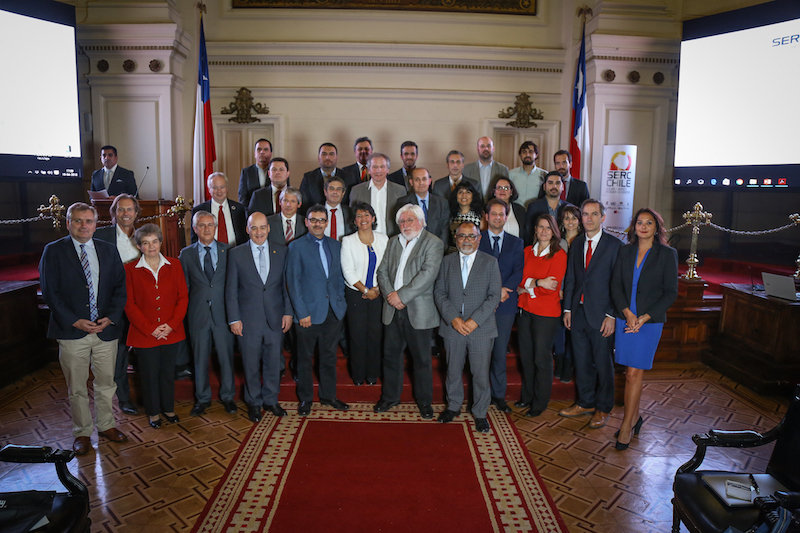 The President of the Mining and Energy Committee of the Senate, Yasna Provoste , highlighted SERC Chile’s collaboration between eight institutions, of the public and private world, that could help to impulse the growth leap that the country needs. “Thank you very much for the work you have done and a lot of success in the future,” Senator Provoste said. Due to an obligation abroad, the President of the Challenges of the Future Committee of the Senate, Guido Girardi was unable to participate. “I want to congratulate this meeting and say that I have the conviction that Chile has unique opportunities in the 21st century, and they have a lot to do with what SERC is doing,” the senator said in a recorded greeting, referring to the importance of research on renewable energy in a critical context of climate change. On behalf of the Ministry of Economy, the Undersecretary of Economy, Ignacio Guerrero, highlighted the importance of turning Chile into a central place in solar energy and offered their collaboration to SERC Chile to work towards that purpose. In his words of greeting, the President of Conicyt, Mario Hamuy, highlighted how important it is for the sustainable development of the country that SERC Chile continues its research work in solar energy for a new period. Rodrigo Mancilla, Executive Director of the Solar Committee, highlighted SERC Chile as having been a strategic partner in the design and creation of scientific and technological content for the Corfo Solar Program. On behalf of the universities and institutions of SERC Chile, acknowledgements went to the Vice-rector of Administration and Finance of the University of Tarapacá, Alvaro Palma; the Dean of the Faculty of Engineering of the University of Antofagasta, Marcos Crutchick; the Rector of the Federico Santa María Technical University, Darcy Fuenzalida; the Vice Rector for Research of the University of Chile, Flavio Salazar; the Dean of the Faculty of Engineering of the Adolfo Ibáñez University, Alejandro Jadresic; the Vice-rector for Research and Development of the Pontificia Universidad Católica de Chile, Pedro Bouchon; the Vice-rector of Research and Development of the University of Concepción, Claudio Valdovinos and the General Manager of Fraunhofer Chile, Joan Bosch. All highlighted the work done in the initial stage and expressed their good wishes for the new phase that SERC Chile begins now. The ceremony culminated with a group photograph, which represents the support of SERC Chile, public institutions, academia, science and private enterprise. The photograph includes the representatives of the universities and institutions that make it up; the academic council and the advisory committees of SERC Chile; representatives of public institutions; representatives of Conicyt and partner companies of the center in the Ayllu Solar and AtaMoS-TeC projects, the BHP Billiton Foundation, Cintac, Colbún, Syntec, Innova Renovable and Solar Pro.